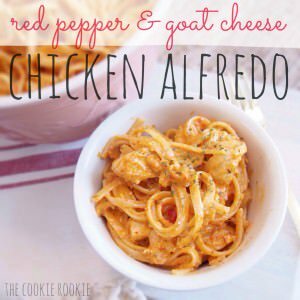 the delicious and savory meal is SO easy and your entire family will love it! Pour in cream, goat cheese, salt & pepper. Stir to melt the cheese and keep on low heat to continue to thicken. add peppers to sauce and continue to stir. remove from heat. put the sauce back over low heat and add cooked chicken strips or shredded chicken. continue stirring. toss in cooked pasta and make sure its coated completely.